November 27, 2017 at 12:28 pm. The Crimson Tide lost 26-14 at Auburn on Saturday, and while that’s no crime, Nick Saban’s juggernaut, the one always getting the benefit of the doubt (and usually deservedly so), also lost its cover. Alabama can’t play its way into the College Football Playoff for the fourth time in four seasons, and it can’t bluff its way in either. 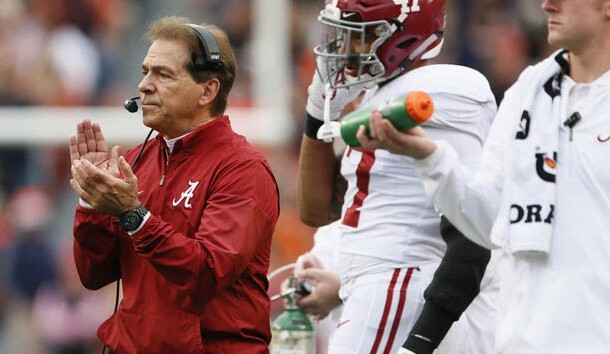 “I think this team deserves the opportunity to get into the playoff by what they have been able to accomplish and what they have been able to do,” Saban said after the Auburn game dropped the Tide to 11-1. But the Tide don’t have the resume — their best wins are over LSU and Mississippi State, the latter of which just lost to Ole Miss in its regular-season finale. Alabama’s season-opening win over Florida State came when the Seminoles still had their starting quarterback for a while, but that victory ended up paying only pennies on the dollar. Beyond the full body of work, here’s the real catch — Alabama doesn’t have the eye test either. The thought has been that the College Football Playoff selection committee wouldn’t have the brass to leave the Tide out of the playoff. But the Auburn loss gives the committee an out. That wasn’t a fluky loss. Auburn was in control, finishing on a 16-0 run. No Kick Six needed. And a week earlier, Alabama had to rally in the fourth quarter to beat Mississippi State. So, the Tide didn’t finish strong either. –Wisconsin, if it beats Ohio State in the Big Ten title game. The dominoes could still fall in Alabama’s favor. A TCU victory and/or an Ohio State win makes things clear as mud. The big question: Would the committee take a two-loss Big Ten champ Ohio State, with better victories than the Tide but a worse loss (Iowa), over Alabama? Weird: The next Saban-Urban Meyer battle could be fought without them in a hotel meeting room. Another question: Why would a two-loss Oklahoma team be a worse pick than Alabama? So, this is the year. Leave Alabama out. 1. New leader for national coach of the year. It’s Fresno State’s Jeff Tedford. In a coaching world that is skewing toward younger candidates, Fresno State tabbed “retread” Jeff Tedford, who transformed the Bulldogs from a 1-11 team into one that is 9-3, including a victory over No. 23 Boise State on Saturday. The teams meet again Saturday in the Mountain West title game. 2. Oregon is going to be factor in 2018. The Ducks are just a way different team when quarterback Justin Herbert is healthy. Oregon figures to return 15 starters next season, and Herbert should at least show up on the fringes of preseason Heisman lists. 3. Now you know what the fuss about Dwayne Haskins is about. The Ohio State redshirt freshman picked up for J.T. Barrett on Saturday with calm, clutch third-down throws in 31-20 win over Michigan. He completed 6 of 7 passes for 94 yards. 4. Our top four teams RIGHT NOW, regardless of resume, schedule strength, etc: Clemson, Auburn, Oklahoma, USC. Yeah, USC. 1. UCLA got its man. Chip Kelly isn’t everybody’s coaching flavor, but his offense will be a nice recruiting counter-point to USC’s pro-style attack, and he’ll haul in plenty of athletes from the L.A. area. Kelly reportedly rejected a better job (Florida), but he’s a better fit back in the Pac-12. This has to be the last chance for athletic director Dan Guerrero, who already is past his expiration date, having hired and fired three football coaches (Karl Dorrell, Rick Neuheisel and Jim Mora). 2. Arkansas might have to get in line. As of Sunday morning, there were four “Help Wanted” signs hanging from SEC football programs: Ole Miss, Florida, Tennessee and Arkansas, which fired Bret Bielema after Friday’s loss against Missouri. That’s a lot of competition in an already wildly-spinning coaching carousel, and the Hogs might have to look off the beaten path. 3. ASU wants more. Todd Graham won the Pac-12 South in 2013 and wrapped up a better-than-expected 2017 regular season with a 7-5 record, capped by a victory over rival Arizona, against which he went 4-2. It wasn’t enough. ASU, with new and remodeled facilities — and the sometimes-fanciful sense that it is a sleeping football giant — fired Graham on Sunday morning. Wait. Isn’t this a basketball school now? 4. Scott Frost will go home. The former Nebraska quarterback and the current head coach of unbeaten Central Florida has his pick of jobs. New Cornhuskers athletic director Bill Moos, in a somewhat unusual move, didn’t hide from such speculation after he announced that coach Mike Riley had been fired. “Scott is someone I am considering, but I’m being very sensitive to that fact that he’s still coaching a team and he’s having a heck of a run.” UCF plays in the American Athletic Conference title game on Saturday. 5. Where does Florida go? No Chip Kelly. Scott Frost could stiff-arm the Gators. Would Willie Taggart leave Oregon after one season? Would Charlie Strong leave South Florida after one season? Memphis coach Mike Norvell is awfully hot right now, with the right offensive pedigree. But by the time you read this, Mississippi State coach Dan Mullen might have the job. 1. Oklahoma QB Baker Mayfield. His bad behavior might cost him some votes, but whatever. Clear space in the trophy case; he’s winning this thing in a landslide. 2. Stanford RB Bryce Love. A Stanford player — Toby Gerhart, Andrew Luck (twice) and Christian McCaffrey — has finished second in the Heisman balloting four times in the past eight seasons. Why not again? 3. Louisville QB Lamar Jackson. He didn’t have a 2017 “Heisman moment” and he suffered a little bit from being yesterday’s news, but his numbers are similar to his 2016 Heisman-winning season, which means they are fantastic. 4. Wisconsin RB Jonathan Taylor. He has 1,806 rushing yards as a true freshman and can move up on this list with a big day against Ohio State in the Big Ten title game. 5. UCF QB McKenzie Milton. He leads an undefeated team, is second nationally in passing efficiency to Baker Mayfield, and has 30 touchdown passes against only six interceptions. Throw in 429 rushing yards, too. 2. Wisconsin vs. Ohio State, Big Ten title game (Saturday, 8 p.m. ET) — The unbeaten Badgers have yet to out-run all their critics, but the resume questions fall away with a win over Ohio State. Early call: Wisconsin gets it done. 3. Clemson vs. Miami, ACC title game (Saturday, 8 p.m. ET) — It’s a College Football Playoff quarterfinal game. Winner advances. Hurricanes have to recover quickly from loss at Pitt. 4. Oklahoma vs. TCU, Big 12 title game (Saturday, 12:30 p.m. ET) — The Sooners had 38 points at halftime against the Horned Frogs on Nov. 12 before coasting to a 38-20 victory. With a TCU win, the Big 12 in danger of being left out of playoff, but this sure seems like Oklahoma’s year. 5. USC vs. Stanford, Pac-12 title game (Friday, 8 p.m. ET) — The only Power 5 championship game with no playoff implications, but each team is playing its best ball of the season. The North champ has gone 6-0 in Pac-12 title tilts.